They are so versatile and very simple to operate it’s hard to believe sometimes just how much of a benefit a person can get from one. These little machines are great for everything from fitting in short workouts in a busy day to a full 30 minute cardio session. People use them at work, while travelling, in front of the TV, and even for medical needs. Many of the better mini pedal cycles will offer a decent aerobic exercise session. It can’t compare with 30 minutes in spin class but it will get your heart rate up. When your heart is pumping and your legs are pumping, your blood is pumping fresh oxygen through your body. Pedalling at a comfortable resistance for a few minutes means you are burning calories too. If you had one of these at home and pedalled for 30 minutes while watching your favourite show, you probably wouldn’t even notice you were exercising. PLUS you could burn 300 calories that you wouldn’t have otherwise. 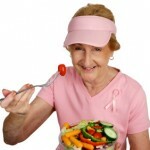 Once your body is burning calories and getting all that O2 – your metabolism is going to climb. 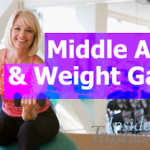 This means that you will start to burn off calories even while you aren’t exercising. You could even be burning more calories in your sleep than before you got your pedal exerciser. 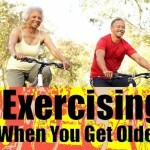 Low impact exercises like cycling can help to keep joints more fluid and healthy. Flexibility improves as well as a reduction in joint pain. Exercise causes the brain to emits happy feel good chemicals. Working makes your brain produce even more powerful chemicals. This is one reason (in theory) why a person will skip a workout but will volunteer to work overtime. Now – Imagine how you could feel if you combine the two. Alertness increases which increases productivity and performance. 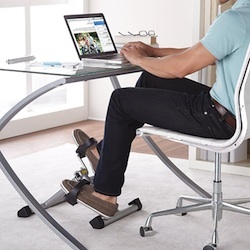 When you pedal on your under desk cycle at work you will be giving yourself more oxygen. This helps to keep the mind alert and the body awake. Some studies now show that the improvement to sleep may not be immediate when a person adds more exercise to their day. However after a couple of months many do start to gain a marked improvement in their ability to fall asleep, and remain asleep. If you are among the number that won’t benefit right away in your sleeping, you still be able to enjoy all the other benefits from your pedal exerciser. When you work your cardiovascular system you are also working your heart muscle. Like any muscle when exercised it gets stronger. That means that it can now pump more blood with less effort reducing the pressure on the arteries. This is what results in lowered blood pressure. 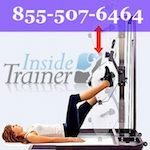 Most machines can be used for both upper and lower body strength cycling exercises. As well, most of them will pedal forward and backwards so you can tone and strengthen by hitting your muscles in different ways. For example, when you pedal forward with your legs you work your muscles differently than when you pedal backwards. As well, if you use the foot straps to their advantage you can get a push/pull action going with your legs. Using your upper body can develop tone and strength in your shoulders, upper arms, forearms, hands, back, and chest. Here is more information on the different types and styles of pedal exercisers. I’m 65 and work all day at a desk as I’m an executive assistant. Have been for more than 20 years. I just purchased the deskcycle and absolutely love it. Too bad I didn’t know about this years ago. No worries, it’s certainly helping me now. I’m trying to get back in shape as I’m many many lbs. over. When you work long hours and it takes an hour or more to get home, the last thing you are thinking about is immediately going for a walk. We also had standing desks (varidesk) but I didn’t like it as much as standing too long hurt my legs. Not this. It keeps my circulation going and I bump it up when playing more upbeat music. I have my fitbit positioned around my ankle and over the last few days I have been logging 13-14k steps. I feel it in my core, legs, and hips depending on how much I get into the cycling and music. Also doesn’t bother my knees; actually loosens them up. I also feel it has made me more focused on my work and I tend to get more done. Not up moving around as frequently as I don’t need to. The cycle goes forward and backward and I try to vary the speed or intensity with my legs pushing and pulling. The deskcycle also has 8 tensions. As I’ve had mine only for a week now, I have it on 4 and feel very good at that level. This thing has made me feel better mindfully as well. Oh well, just doing a little research on the subject and came across your article. Just wanted to share my experience. Definitely one of the better purchases I’ve ever made. Go for it; you have nothing to lose but calories and only good health to gain. Hi Gloria – I’m glad you are getting great benefit from your DeskCycle. I love it too. I appreciate you passing on the positive words for others to read. I just got a desk job where I am unable to leave my desk. As a result, I was getting awful edema in my legs. I bought a basic peddler, and it has help me immensely! Not only is it providing me relief from leg swelling, but I am buring about 600-700 calories a day with little effort (I bike almost my whole shift). I actually do feel more energized. Great investment. I might upgrade to a deskcycle for more power in the future, but a simple peddler is a great start to see if you like the exercise. 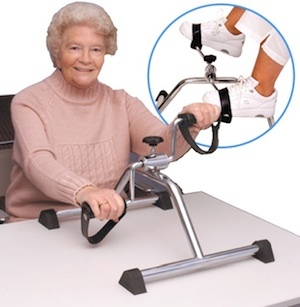 I just purchased a pedal exerciser, I am cold sitting at my desk all day, I am hoping using this will help. it seem to fit fine under my desk and was easy to assemble.